This 3.5-10X40 Leupold VX-3i is an excellent all-round rifle scope for hunters of all skill levels. Leupold’s Twilight Max Light Management System and Diamondcoat 2 are in play to give you maximum brightness, color contrast and the best possible light transmission. This particular VX3i is available with a range of reticle options, including illuminated, but the scope we have featured here contains the standard Duplex which is an ideal general-purpose reticle. The new Leupold VX-3i is the next step up in quality from the VX-1 and VX-2 if you want premium usability and glass. With added features, more reticle options, and a huge VX-3i line to choose your favorite, you’re not going to be left disappointed. It’s still very new to the optics market right now since it had its debut in 2016. But, judging by the very high, near perfect ratings for the VX-3 rifle scopes online, the VX-3i scopes are going to out-do themselves. I wanted to pick one of Leupold’s premium rifle scopes to feature in our reviews, for those of you who are looking for more flair and glimmer without hitting the four figure price range. If you liked the VX-3 or heard excellent things about it, then you’re going to want to get your muddy mitts on one of these. Since you’re going to be spending premium cash for a premium scope, you might want to make sure you’re getting the best bang for your buck. If you’re not sure if the VX-3i line is for you, let the Q&A convince you otherwise. Does the VX-3i series have a scope suitable for a beginner? The VX-3i rifle scope series definitely has a scope suitable for a beginner. This 3.5-10X40 model is an excellent tool for hunters of all skill levels. It’s a great all-round rifle scope that’ll get you up close and personal for forested areas or out and far for the open fields. But, to see an absolute range of what this series has to offer, you’ll have to check out Leupold’s website to scout through the 23 models of rifle scopes they’re boasting about! There’s no doubt that this line will have a scope that’ll fit the needs of a weathered and seasoned hunter or a humble beginner. From the lowest power range model, the 1.5-5X20, to the highest, the 8.5-25X50 – you’ll find the right tool for the job. They also have numerous reticles available other than the standard Duplex that comes with this specific model. 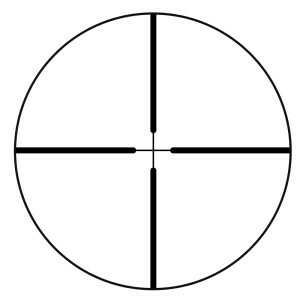 Some of these include the Ballistics Aiming System (BAS) Boone & Crockett reticle, an illuminated reticle, BDC reticle, or the BDC dial/turret. There’s so much to choose from in the 2016 VX-3i line. How much does this VX-3i rifle scope cost? This VX-3i 3.5-10X40 with the Duplex reticle costs around $400 online. While it’s on the more expensive end for what most hunters are looking at paying, it’s an excellent buy. I’m not just saying that because I’m partial to Leupold’s tactical scopes. This scope well and truly earned its place on our line-up of the best rifle scopes priced below $500. This particular model is actually on the cheaper end of the VX-3i line. Most of the other models are going to run up much higher than this one. The most expensive scope in the VX-3i line is around $1200 and is the 4.5-14X56 Side Focus with the Illuminated Reticle. Now, that scope sounds like it’s got some serious low light hunting perks goin’ on. What kind of eyepiece does this scope have? This Leupold VX-3i rifle scope has a fast focus eyepiece that’s able to speedily get your reticle into focus with your eyes and assume a “locked” on target acquisition. While the American-style classic eyepiece nearly always comes with a locking mechanism to prevent it from being bumped out of focus, the European-style fast focus eyepiece is most of the time lacking this locking feature. But, trust the VX-3i to be different from the rest. This fast focus eyepiece also has a locking mechanism built in. That’s a nifty little bonus right there. What is Leupold’s Custom Shop? It’s exactly what it sounds like. Leupold has their own custom department where you can build your dream rifle scope. No more having to be limited to what they have to offer. You can combine features from other scopes to create the one of a kind tactical scope you didn’t think you could buy. Even if you’ve bought a VX-3i rifle scope, you can send it to the custom shop to have the reticle changed, the parallax reset, or a custom ballistic turret designed for your exact caliber and bullet data. After this, you might want to give her a name… if your wife doesn’t mind. Are the Leupold VX3 scopes still available? The VX-3i series came out in 2016 and replaced the now discontinued VX3 line. While this might be a shame for some of you, there’s still hope. Although Leupold no longer markets the older VX-3 on their website, you have the advantage that the VX-3i has just hit the market, giving you lots of time to stalk out independent dealers that still have more than enough VX3 scopes for sale. But then, considering the new VX3i is optically superior to the older VX3, you might be better off embracing the new line. According to the bull’s-eye, the Leupold VX-3i 3.5-10X40 rifle scope is a sharp-shooter. It might definitely be too highly qualified to be handled by your muddy mitts. One downer is the 29.8 max field of view. While it’s not that bad, it’s still a lot smaller than a standard 33 or even a really nice 40 feet field of view at 100 yards. Really though, not a big deal if you know where you’re looking. Close to 400 bucks might be splurging for you. Don’t worry, you can still land a quality Leupold scope for less than $200. Take the Leupold VX-Freedom 3-9X40 for example, it’s a winner in every right. We’re not kidding, it’s definitely an extremely popular scope. Leupold does everything to a T. It’s why they’re beloved by their fans and they’ve been able to keep them loyal. If you want to put your business and loyalty with a brand you can trust, Leupold it is.